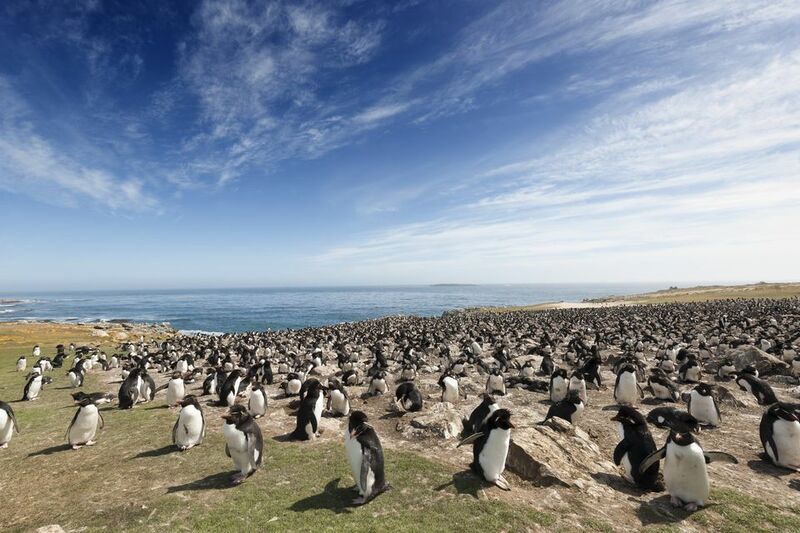 Located about 300 miles off the coast of South America in the southern Atlantic Ocean, the Falkland Islands are remote, wild, and beautiful. The place is probably best known for being at the center of a conflict between the U.K. and Argentina back in 1982, in what would become known as the Falklands War. But, it is a destination that has plenty to offer adventurous travelers looking to get off the beaten path, including amazing landscapes, abundant wildlife, and a rich history that dates back nearly 300 years. Just getting to the Falkland Islands can be quite an adventure. Commercial flights from Argentina are still banned thanks to a frost relationship between the two countries following the 1982 war. LATAM offers a single flight out of Santiago, Chile every Saturday, with a stop in Punta Arenas along the way. There are also two flights a week out of the U.K. as well, with a stop in Ascension Island en route. It is also possible to visit the Falklands by ship, with regular departures out of Ushuaia in Argentina. The journey takes about a day and a half to complete, with whales, dolphins, and other sea life often spotted en route. Adventure cruise companies like Lindblad Expeditions also offers journeys to the Falklands and beyond as well. Roughly 3000 people live in the Falkland Islands, with perhaps 2000 of those residing in the capital city of Stanley. The town will give visitors the impression that they have stepped foot into an English village, complete with British architecture, flags, phone booths, and accents. Quaint shops, restaurants, and pubs complete the picture, although they aren't the only sites to see while in Stanley. There are also several monuments to the naval and military heritage of the Islands, as well as a museum dedicated to the history of the Falklands. Be sure to drop by the harbor, where a ship wreck or two can be spotted in the waters, and no visit to the capital would be complete without dropping by the Christ Church Cathedral and its famous whalebone arch. More than 70% of the world's population of black-browed albatrosses nest and breed in the Falkland Islands, and the largest of those colonies can be found at a place called Steeple Jason. This tiny island is remote, even by Falklands standards, and it isn't easy to get to. Weather and tides often make it impossible to land there for weeks at a time, but those who are lucky enough to visit this place will be treated to a rare site. Steeple Jason is home to hundreds of thousands of albatrosses, many of which have wingspans that are more than 7 feet in length. And since they see such few visitors, they allow travelers to get within a few meters of their nests. It is an impressive sight to see for sure. The 1982 Falklands War left its mark on the islands in more ways than one. While many of the locals continue to have lasting memories of that conflict, there are still bomb craters, military equipment, and even live ammo littering the landscape. Several guide services in Stanley can organize a tour of the nearby battlefields, taking visitors through some of the more pivotal showdowns of the war both on foot and by vehicle. The rocky, mountainous terrain just outside of the capital was the stage for several battles between the British and Argentine armies, and the remnants of that engagement can still be found there, including some moving monuments to fallen soldiers. The Falklands offer some excellent hiking for those who want to get out and stretch their legs. There are a few trails within easy distance of Stanley, but to truly experience what the Islands have to offer you should get out to a more remote place. The chances of running into other human beings is almost nonexistent and the landscapes are wide open. You'll have the chance to spot some of the large birds that call the region home, and you'll walk where few others ever get the chance to visit. Carcass Island is a the perfect example of this. As one of the largest islands in the west Falklands, it has been a sheep farm for more than a decade, and a small settlement there welcomes visitors. But for the most part it is uninhabited, offering solitude for those looking to explore on foot. Look closely, and you might even spot a penguin or two. While birds are the primary creatures that inhabit the Falklands, there are some very special birds that aren't found in a lot of different places. For instance, the aforementioned black-browed albatross isn't a common site in most places of the world, and the Islands are home to no less than three different species of penguins, including rockhoppers, gentoo, and Magellanic. But, there also large populations of seals and sea lions as well, including many southern elephant seals. These creatures are found throughout the region, but one of the best places to see them is on Sea Lion Island, which actually has a lodge where visitors can book a room for few nights. This gives them the opportunity to truly take in the sites and sounds of these wild creatures in their natural habitat. Part of the fun of a visit to the Falklands is getting a chance to explore on your own. Leave the capital city of Stanley behind and head out in a rental vehicle to explore the region on your own. There are a number of wonderful small villages to visit including Salvador, which is known for its great wildlife, and Darwin, which has some good hiking routes too. These smaller villages are quaint, lovely, and sparsely populated, but offer insight into life in the Falklands from a different perspective. Plus, you never quite know what you'll discover as you wander further afield. This is just a taste of what the Falkland Islands have to offer. In terms of remote, yet still highly accessible, places it is one of the best destinations anywhere. And best of all, you won't have to battle lots of other travelers to enjoy everything that it has to offer.